Fruit leathers also known as fruit roll ups are one of the simplest things you can do to preserve a large amount of fruit at home. Not only are they really tasty, they are also healthy as the only ingredient you really need is fruit. Drying food as a means of preservation is one of the earliest means of lengthening the lifespan of various food sources. In many countries, the climate is well suited to drying. Our early ancestors probably noticed fruit naturally drying in the trees for example and how it still tasted good and more concentrated in flavour. It isn’t much of a stretch to see how this could be utilised as a means of food preservation. Fruit leather is a perfect way to preserve a glut of fruit. 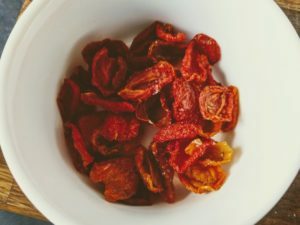 The action of dehydrating the fruit not only prevent spoilage but also intensifies the flavour and changes the texture similar to that of a chewy sweet. This is one of the reasons why kids tend to love fruit leathers. Enzymatic reactions are happening all the type. One of the things you may notice as fruit sits in the bowl is that some fruit continues to ripen or soften. This is in part due to enzymes contained in the fruit breaking down the cell structure, converting starches to sugars and enzymes that change the colour of the fruit. Bacteria yeasts and mould are another means of spoilage. You may have often seen this happen in your fruit bowl. If you leave fruit for too long it can develop mould and of course, then needs to be chucked away. Along with mould, you have yeast and bacteria that will be present that will spoil the fruit. In the presence of moisture which fruit is full of these two means of spoiling can happen. When the fruit has dried both enzymes and bacteria cannot function or grow so the dried fruit can be stored for long periods. 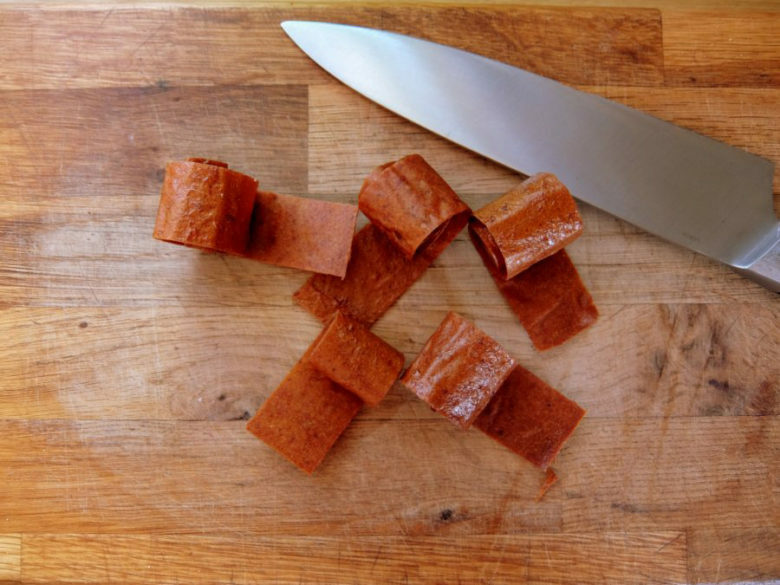 Fruit leather gets its name from the way it looks and the texture. Fruit is pureed and dehydrated. Once dried the texture is similar to leather in that is is slightly shiny and smooth. The process of making it is very simple and it can be done with just a few kitchen items. 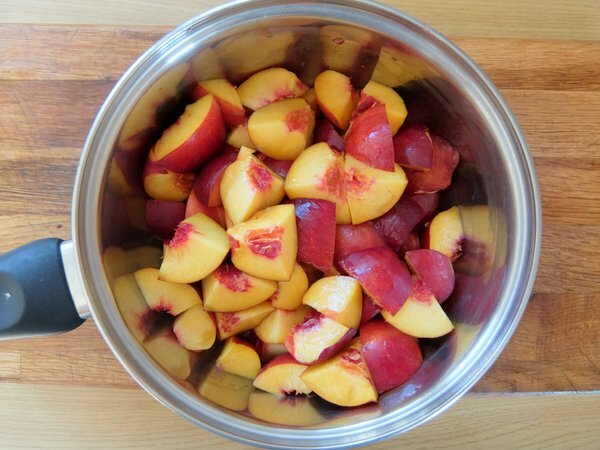 In this post I am going to show you how I make Nectarine fruit leather. You really can capture the flavour of nectarines in the finished leather and you will find the flavour intense, sweet and the texture chewy. That really is all you need. I added honey to my nectarines for a little extra sugar and the subtle honey flavour goes really well with nectarines. You do not have to add any extra sugar as most fruits have more than enough to make an appetising fruit leather. There are a couple of options here. I have a food dehydrator, if you have one yourself I would recommend this as the way to go. Using a dedicated food dehydrator is a lot more efficient. 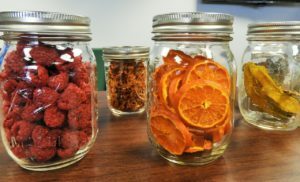 You can usually buy a dedicated fruit leather sheet (sometimes called fruit roll sheets) to put in your dehydrator and because our goal when making fruit leather is to dry out the fruit a dehydrator is a lot quicker as well as using less energy. The other option which is what I will show you here as I know many people may not have a food dehydrator is to use the oven. As I mentioned making our nectarine fruit leather in the oven will take a little longer and use a little more energy but it tastes just the same. 1. Wash and rinse the nectarines and prepare by removing the stone and chopping into quarters. 2. As the nectarines a typically a lot juicier than other fruits we want to get a head start on the drying process. To do this add the quartered nectarines to a pan and gently heat. At nectarines warm up the fruit will begin breaking down and the juice will start running free. If you are using another fruit such as apples you won’t have to do this step, simply pulping the fruit should be enough. 3. If you are using honey add it now and this will help extract more of the juice out of the nectarines. 4. Gently raise the heat and simmer for around 20 – 30 minutes. The idea here is to evaporate some of the juice so it quite so long to dehydrate in the oven. 5. We will need to pulp the nectarines, for this I used a hand blender which did the job just fine. 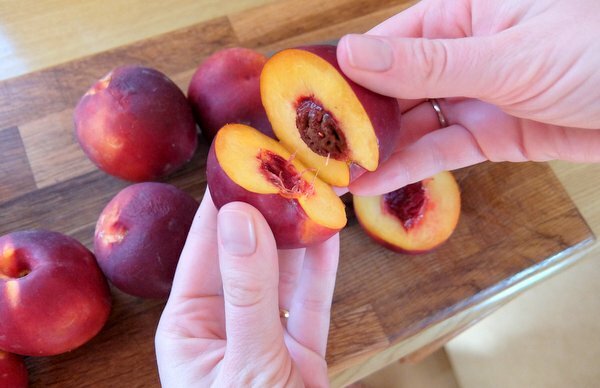 You will want to let the nectarines cool slightly before doing this to avoid any burns. 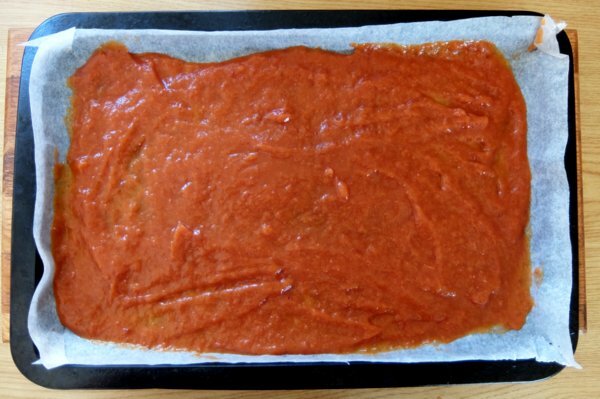 We are looking to make a puree, something around tomato ketchup or slightly thicker. If there is still a lot of liquid carry on heating for a few more minutes to reduce it down. 6. After reducing let the fruit cool down slightly. Line a baking sheet with parchment and spread the fruit puree out so it has an even thickness of around 1/8th inch (2-3mm). This will ensure even drying and the fruit leather will have nice finished consistency. 7. 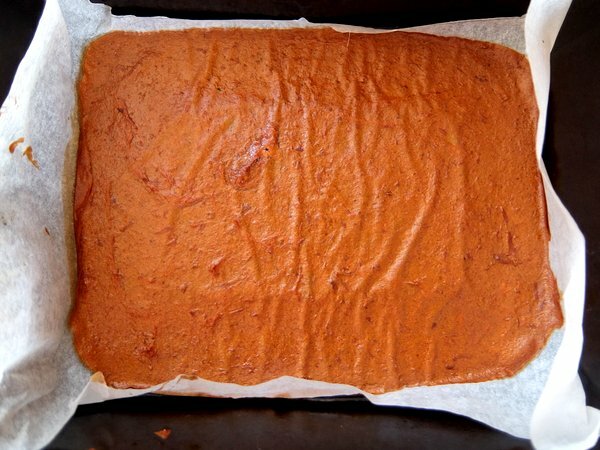 Place the fruit leather in the middle of the oven heated to its lowest temperature. Aim for around 120°F (48°C), to get it this low you may have to crack the oven door open as many ovens don’t go this low. 8. 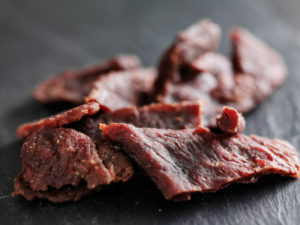 Drying times will be around 6 – 8 hours or more depending on the thickness of you fruit leather. Keep an eye on the temperature if it gets too high turn off the oven and leave it warm for an hour before turning it back on. 9. Once dried the fruit leather will not feel tacky anymore. Once completely dried you will be able to cut the fruit leather into strips and roll. If you wish you can leave the fruit leather on the baking parchment. It should be fine without, however. If you manage to save any fruit leather, which is hard because it disappears pretty quickly in my house, you will want to store it. Fruit leather will keep for about a month in a cool dry place. It is best to keep it in an airtight container as you want it away from moisture. As we have worked hard to dehydrate the fruit leather we want to keep moisture away as the fruit leather will naturally want to reabsorb moisture. If you want to keep the fruit leather longer than a month then you can store the nectarine leather in the freezer for up to a year.